One of the biggest credit rating agencies in the country issued a stark warning to U.S. cities and states this week. Prepare for climate change, or risk being downgraded. NPR's Nathan Rott reports. NATHAN ROTT, BYLINE: It's hard to put a dollar amount on climate change, but it's fair to say that it will be costly. Damage to and loss of coastal property, changes in agricultural production, increased energy use - those are just some of the negative economic impacts listed in a new report by Moody's Investor Services. MICHAEL WERTZ: Climate change also entails things like increased risk of droughts and wildfires and heat-related mortalities and heatwaves. ROTT: Michael Wertz is a vice president and senior analyst at Moody's, and he says it's important for credit rating agencies to take all of those risks and what's being done to mitigate them into consideration when they're grading a local government. WERTZ: If you have a place that simply throws up its hands in the face of changes to climate trends, then we have to sort of evaluate it on an ongoing basis to see how that abdication of response actually translates to changes in its credit profile. RACHEL CLEETUS: These types of risks are now being recognized in the marketplace because they're causing multi-billion dollars' worth of damage already. ROTT: Rachel Cleetus is the lead economist at the Union of Concerned Scientists, and she says this is a wake-up for those that think of the damages of climate change as a future issue. CLEETUS: What we're seeing through this type of a market-based signal is that, yes, people have to start making decisions now based on what is already baked in reality for many of these places. 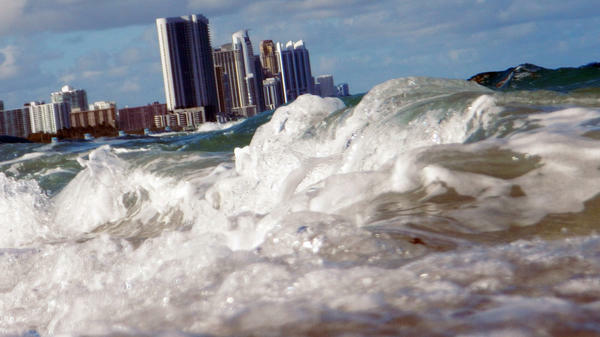 ROTT: Places like Broward County, Fla. Broward County is in southeast Florida, where seas are expected to rise by at least a half a foot by 2030. The county has been aggressive in preparing for that rise and the increased coastal flooding that will come with it. Jennifer Jurado is the county's chief resilience officer. JENNIFER JURADO: We create barriers to flood waters. We elevate properties. We manage storm water. ROTT: The point is Broward County is preparing for climate change even though it hasn't been easy politically. Jurado says it can be hard to get policy makers to back big investments when the associated risks or benefits seem to be so far down the road. That's where Moody's announcement comes into play. JURADO: Now we've got the incentive on an annual economic basis to make the smart investments that we've been arguing for. ROTT: That's assuming that Moody's follows through with the warning and actually downgrades a place that isn't taking similar steps. Nathan Rott, NPR News. Transcript provided by NPR, Copyright NPR.